Anger can be healthy if the emotion is controlled and used sparingly. 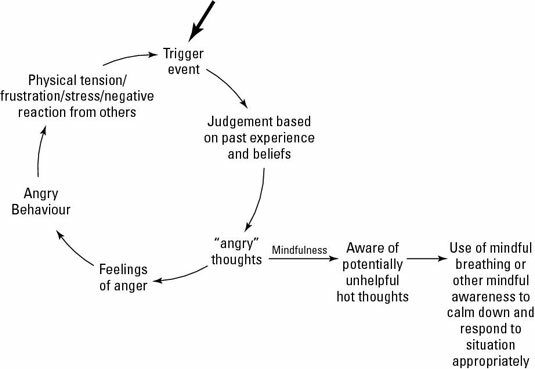 Mindfulness can help cool the unwanted, unhealthy anger. When is anger helpful? Healthy anger is good if you’re being treated unfairly, and need to become angry to ensure you’re treated justly and with respect. However, being out of control when you’re angry can cause tremendous harm both to yourself and to your relationships with others. Become aware of the physical sensation of anger in your body. Notice the sensations in your stomach, chest and face. Become aware of your rapid heart and breathing rate. Observe if your fists or jaw are clenched. Breathe into the physical sensations of your body. Close your eyes if you want to. You may find counting out ten breaths helpful. Imagine the breath entering your nose into your belly, and as you breathe out, imagine the breath going out of your fingers and toes, if you find this useful. Continue to stay with the sensations as best you can. Bring a sense of kindness and gentleness to your feelings of anger. Try to see the anger as an opportunity to understand about the feeling, how the burning rises up in your being, and how the breath may or may not have a cooling effect on the flame within you. Thoughts like ‘it’s not fair’ or ‘I’m not having this’ feed anger. Notice what effect you have by letting go of these thoughts. If you can’t let go of the thoughts, which is common, continue to watch the way thoughts and feelings feed each other. Take a step back from your internal experiences. Notice that you’re the observer of your thoughts and emotions and not the thoughts and emotions themselves. As soon as the main force of your anger has dissipated, you may need to communicate your feelings with the other person. Begin with ‘I’ statements instead of ‘you’ accusations. As you continue to communicate, stay aware and awake to your own feelings, and let go of any aggression if you can – less aggression and more honesty are more likely to lead to a harmonious and productive conversation and result. Coping with anger is a challenging task. The idea is to keep these steps in mind, and follow them with small levels of frustration rather than outright anger. When you do, you become more adept at cooling the flames of anger. Over-generalizing by using sentences like ‘You always ignore me’ or ‘You never respect me.’ Be specific instead. Mind-reading by thinking you know what the other person is thinking, such as ‘I know you think I nag you too much.’ Try to avoid making assumptions like this. Blaming others for your own anger with thoughts like ‘You always make me angry’ or ‘It’s all their fault.’ Instead, take responsibility for your anger. Mindful physical exercise. By exercising regularly, you build up a greater resilience to stress and this may dissipate some of your anger. By exercising mindfully, you simultaneously build up your mindfulness muscles too, leading to greater levels of awareness and less reactive, automatic-pilot behavior. Connect with your senses. Listen to the sounds around you or listen mindfully to some music. Smell some of your favorite, calming scents. Have a shower or bath and connect with the sensations on your skin. Cultivating a mindful attitude can reduce the frequency, duration and level of anger you experience from day to day. Mindfulness groups sometimes take an approach with the acronym RAIN for a mindful way of dealing with emotions. Recognize that a strong emotion is present. Often, you can easily be swept up by the emotion itself, and immediately begin acting on it. Emotions can be such an integral part of who you are that you don’t give the feeling due credit. Begin with recognition of the emotion. Accept that the emotion is there. With strong emotions, sometimes the natural reaction is to pretend the feeling isn’t really present. In this step you accept that in this precise moment, you’re experiencing anger. You aren’t being passive and giving in to the feeling. If you don’t accept what’s here now, you can’t hope to manage the emotion in any way. Investigate thoughts, feelings and bodily sensations. In this third step, observe what’s going on in your mind, heart and body. What thoughts are running through your head? What feelings are you mindful of? What areas of your body feel tense, or burning, or warm, or relaxed? Where is the core of the emotion located exactly, and what effect does a sustained mindful awareness have on the physical aspect of your experience? Non-identification with the passing emotion. Emotion has the word motion in it. Emotions are always moving, fluxing and changing. This final step is to try to distance yourself and create a space between you and your emotion. The emotion is more likely to do what emotions do quite naturally, which is to keep moving. Anger comes and goes, but you don’t come and go – you’re always here.